Have you ever looked at a picture and been instantly transported to a new place full of adventure and discover through that picture? It's kind of like a book with no words. An intriguing picture can take you ANYWHERE! That is sort of the feeling I got when I saw this great image from Crafter's Companion. I love it! It is like an instant journey to a magical place! 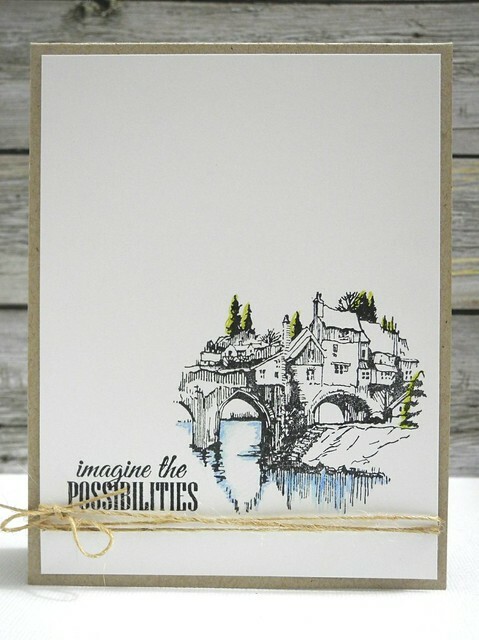 I used the gorgeous Art-Kure Elvet Bridge, Durham stamp with a great sentiment from True Colors. I love how well the sentiment worked with this image! I added just a touch of color with Spectrum Noir colored pencils and then a bit of burlap string from May Arts. Love the simplicity on this one. It makes me happy. If you are interested in gorgeous images that take you on a journey, be sure to check out the entire Art-Kure line! I really love these stamps! Nice! I really like this image too! Perfect card! Happy TGIF!!! What a great image! Love the selective coloring! I seen this on Facebook.. totally fabulous.. Stunning, I love the touch of color for water and trees, CAS perfection ! Wow, I can instantly imagine horse and carriage's, princesses...what a fantastic stamp! It goes really well with the kraft cardstock and burlap twine, really helps with the fairytale theme that I can see. Brilliant! Ooh, I love this image and the little touches of color add so much! What a great stamp, Jennifer! 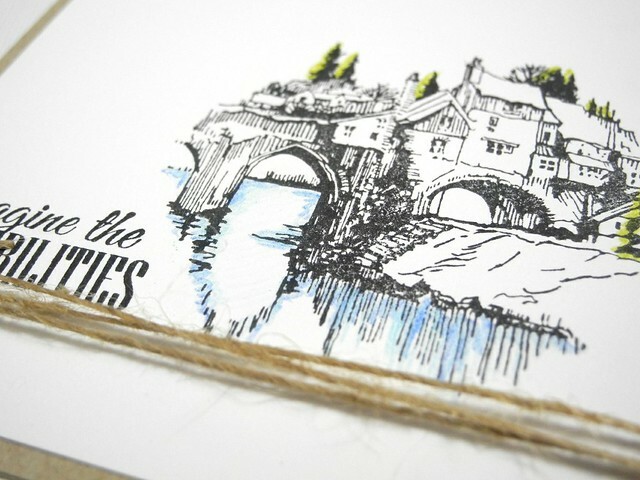 Just love your card; the minimal coloring is perfection! Such CAS perfection.. so beautifully designed.. so elegant. LOVE this!! !